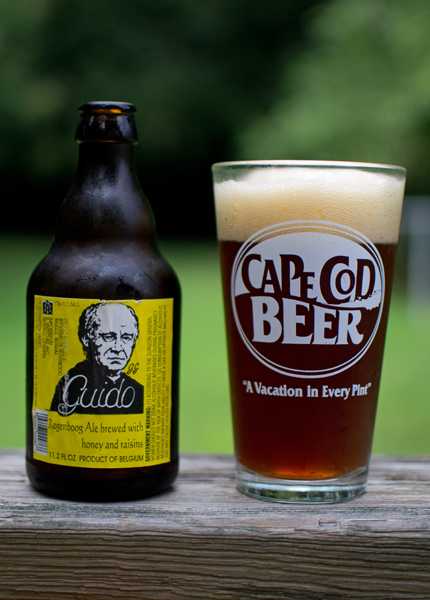 Beer #253 is Guido by Brouwerij Smisje from Belgium. 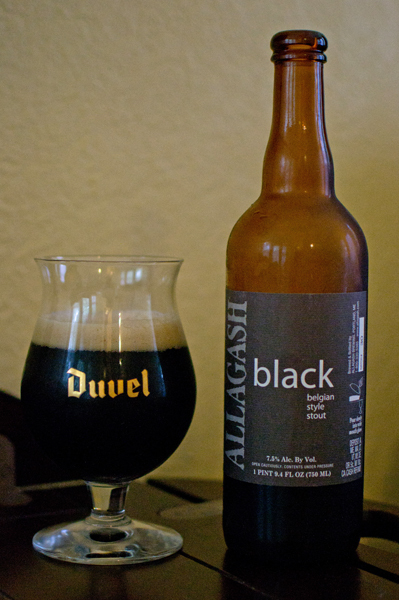 This beer is brewed in the style of a Belgian Strong Dark Ale with an ABV of 8%. It poured into my pint glass with a dark reddish brown. The head was huge, tan, and very fizzy at first but it receded very quickly to nothing. 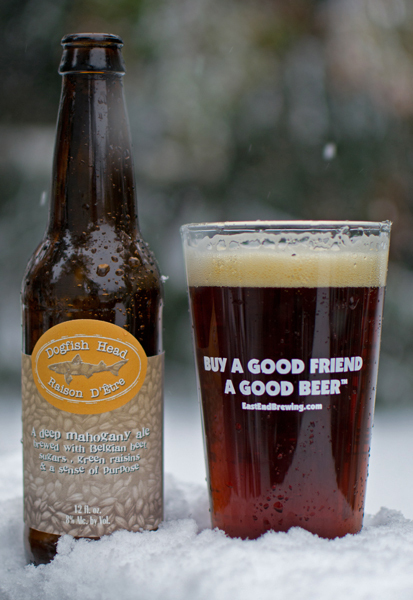 Very malty in the nose with raisins being the most prominent along with a bread aroma…raisin bread anyone?. There was a fruitiness here also with a bit of green apple also in the nose coupled with a spicy Belgian yeasty thing. Very interesting nose overall. I took a sip…whoa baby…this was sour and sweet. It had a apple cider type or grape juice flavor with a taste of crackers, including the dryness of them, near the back end of this. It was kind of like wine. Lower carbonated with a medium body and that sourness make it mouth puckering. The alcohol was nowhere to be found, neither in the nose or the taste. After a week of getting caught back on the Harry Potter movies, today was the day to see the final one, Harry Potter and the Deathly Hallows Part 2. In a word…fantastic! In my humble opinion, it was the best of the Potter movies and one of the best movies I have ever seen. It had everything from awesome action sequences to bring a tear to your eye moments and everything in between. Great, great stuff. It was also an opportunity to take a break from the Horny Goat fest…and seeing how that was going, that was a good thing. On to beer #237. That beer is Terrible by Unibroue from Canada. 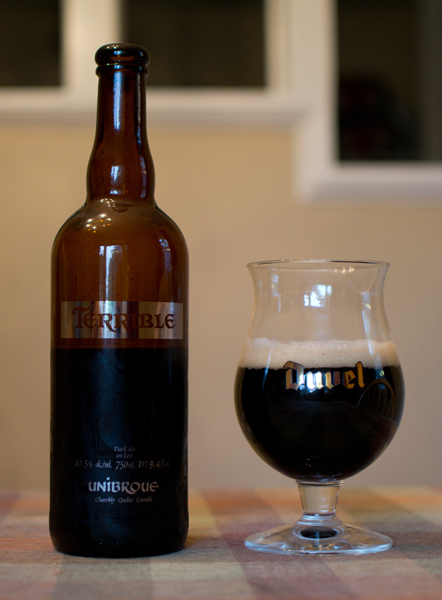 Terrible is a Belgian Strong Dark Ale with an ABV of 10.4%. Lets hope Terrible isn’t truly terrible. Terrible didn’t look terrible at all…it had a nice dark black color with a nice off white head that left some fantastic lacing. The nose was heavy, malty and sweet. I picked up some cherries, a bit of apple, alcohol, a smokiness, raisins, and a faint spice…cloves? The dark fruits take over in the taste (raisins and cherries mostly) with the apples, kind of reminded me of Granny Smith, in the middle. The booze takes over about mid drink too and it finishes with the cloves that I detected in the nose. Couple all of that with a sweetness a bit like brown sugar and you have one fine tasting brew. It had a very dry finish to it along with that boozy burn. It was on the heavy side body wise with light carbonation…it was kind of creamy. This was a sipping beer for sure. This was quite a nice beer that I enjoyed as I was watching Crazy Heart (another good movie BTW) and just relaxing. 88 degrees here today…sounds like perfect weather (though I didn’t check the dew point…I will leave that for Dr. DewPoint) to go mountain biking. Over to Six Mile Run Reservoir with my single speed Haro Mary for my typical out and back of 10 miles had me hot and sweaty and hankering for a beer. Enter beer #224, Brooklyn Local 2 by Brooklyn Brewery from where else…Brooklyn, New York. 9% ABV was in store for me in this Belgian Strong Dark Ale. Lets see how this compares to Local 1 which I had a little over a week ago. Local 2 poured an opaque dark brown with a huge off-white fluffy head with some fantastic lacing. Lets take a whiff, shall we? The first thing I got was apples and alcohol. At times I got a bit of chocolate…odd. Fig Newtons make an appearance here in the nose also. This is quite a bit more malty in the nose than Local 1 with a sweet molasses thing going on. Sure enough the taste of raisins and Fig Newtons along with maybe plums and grapes…yep grapes…appear first. The malts take hold after the fruits with some caramel and molasses type flavors. Alcohol rears its head towards the back end of the sip. It had a medium body with some heavier stinging carbonation. I had to take my time with this…sipping…sniffing…swirling…generally enjoying the experience. Lets take a journey to our neighbor to the north (that is if you live in the USA), Canada. Beer #219 is indeed from Canada…Chambly, Quebec to be exact. 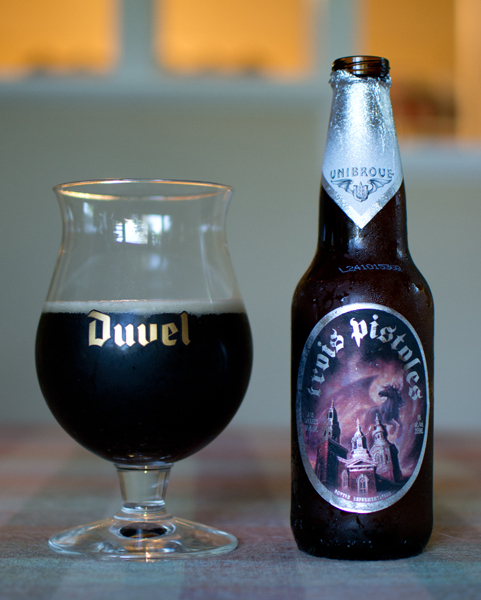 That beer is Trois Pistoles by Unibroue. This is a Belgian Strong Dark Ale and strong it is with an ABV of 9%. Trois Pistoles (Three Coins) is named after a small village in Quebec and has many legends associated to it with the most famous being about a black horse, a good devil in fact, who helped a local bishop build a church. Trois Pistoles pays tribute to that black horse. This beer poured a very dark brown, almost black but not quite, with a thin off-white head. Lets smell it shall we? I got big aromas of dark fruit like raisins and even some black cherries. Massive amounts of that Belgian yeast like smell along with a caramel malt presence and even maybe some brown sugar where also recognizable. There was a ton of stuff going on nose wise and the more I swirled and sniffed, the more things came out like apples and even a Fig Newton like aroma. This was really sweet up front in the taste and fruity (cherries, figs, etc.) with a spiciness similar to black pepper and a decent amount of bready flavors. The alcohol started making itself known as it warmed up. It had a nice medium body with some fizzy carbonation. The sweetness here made this a sipper for me. This was another fine beer from Unibroue. I enjoyed this one quite a bit and urge you to do give it a go if you like dark Belgian style brews. Sante! Happy Valentines day all! How about a big round of applause for the card companies bringing us this day so we can spend money on cards, flowers, chocolates, and just about anything red. All that red means lots of green for those same companies. I too fall pray to the valentine day festivities so much so that I figured what better way to spend the evening with my wife than by watching a nice movie…a horror movie that is. Paranormal Activity 2 sounds just about right for this day of love. Don’t you agree? 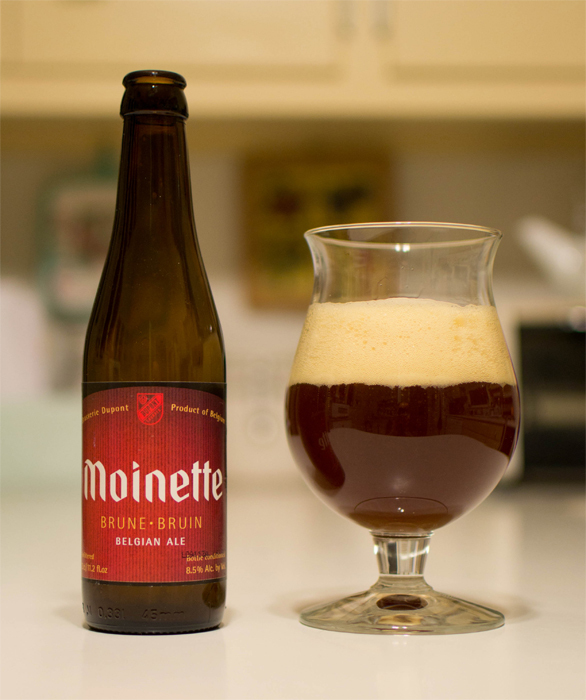 Beer #78 is Moinette Brune by Brasserie Dupont. 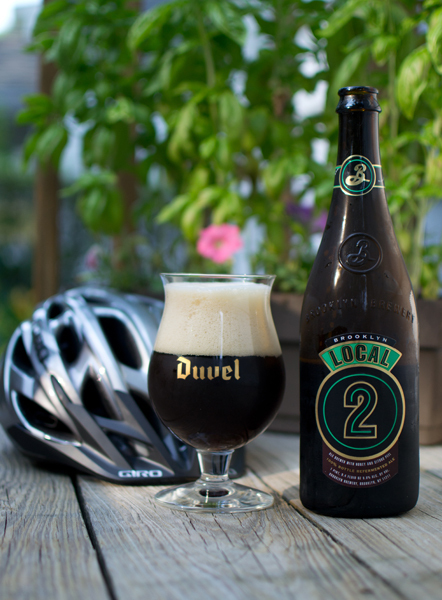 From Belgium with love comes this Belgian Strong Dark Ale. The ABV is a lovely 8.5%, more than enough to get Cupid a little high. It poured a dark brownish orange with quite the head to it. The nose was full of apples and maybe some bread? There was something else that was distinct but I couldn’t identify. I almost think it may have been caramel but I’m not quite sure. Perplexed with the smell, I gave it a swallow. I got a spicy raisin flavor that every once in a while had a cider-like taste to it. It finished very dry. There was a ton of carbonation in the medium bodied brew. The alcohol had a way of sneaking up on me with this one. A solid Belgian style ale that I think Cupid might enjoy once he finishes shooting all of those love arrows.